Tel Hazor sits opposite Kibbutz Ayelet Hashahar on the Rosh Pina-Metulla road. The tell (mound composed of the remains of successive settlements) has two parts: the 30-acre acropolis and the 175-acre lower city. Hazor flourished during the middle Canaanite period (ca. 1750 B.C.E.) 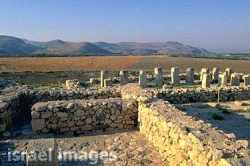 and was the largest fortified area in Eretz Israel during the Israelite period (ninth century B.C.E.). One of the principal cities on the Fertile Crescent, Hazor engaged in trade with cities in Babylon and Syria. Its bronze industry used tin brought from abroad. The king of Hazor was considered on a par with the kings of the important centers in northern Syria, such as Carchemish, Aleppo, and Qatana. The Bible refers to Hazor as "the head of all those kingdoms" (Joshua 11:10). A tour of Hazor is a trip through a time tunnel, with ruins from a number of different periods: fortifications from the middle Canaanite period; a large structure from the late Bronze period (the "castle"); a casement wall and gate thought to have been built during King Solomon's reign; a late-Canaanite altar; and storehouses apparently constructed at the time of King Ahab. Especially interesting are the waterworks, presumably built during Ahab's reign. They were designed to provide the residents of Hazor with a steady supply of water even when the city was under siege. After the waterworks were completed, the people no longer had to haul water from the springs outside the city, but drew ground water from a 45-meter-deep shaft. Antiquities from Tel Hazor are on display at a museum at the entrance to Kibbutz Ayelet Hashahar. Visitors are encouraged to stop at the museum before visiting the national park. Tel Hazor National Park is opposite Kibbutz Ayelet Hashahar on Route 90 (Rosh Pina-Kiryat Shemona), 15 minutes north of Rosh Pina.